Eng. Mansour Al-Shathri, Vice Chairman of the Riyadh Chamber of Commerce and Industry has officially inaugurated HVAC R Expo Saudi and co-located FM EXPO Saudi & Saudi Clean Expo at the Riyadh International Convention & Exhibition Centre (RICEC). Eng. Mansour Al-Shathri took a tour of the expo accompanied by Mr. Giorgio Elia, Vice President, Carrier Middle East Company, Mr. Abdulmohsin Saud Alessa, Board member, Alessa Group (Crafft & Samsung), and Nick Powell, Vice President of event organiser, dmg events. Backed by the Saudi Standards, Metrology and Quality Organization (SASO), GCC Standardization Organization (GSO), and Saudi Council of Engineers (SCE), the fourth edition of the Kingdom’s largest display of heating, ventilation, air conditioning and refrigeration solutions is taking place in Riyadh for the first time. HVAC R Expo Saudi hosts over 85 of the industry’s top regional and international brands showcasing the latest solutions the industry has to offer. The event is free to attend and will run at the Riyadh International Convention & Exhibition Centre (RICEC) until 30 January 2019. Amid reports that air conditioning solutions consume 40% of power generated in the country, Saudi Vision 2030 and its agenda toward a sustainable and efficient future is a key driver for Saudi’s HVAC R market. Exhibitors at HVAC R Expo Saudi represent over 15 countries, and include the likes of Carrier, Zamil AC, YORK, Midea, Samsung, Alessa Group, LG, SKM, Caleffi Hydronic Solutions, VTS Clima, Hitachi, Haas, Gibson, Rheem, RIG, BNF and many more. More than just an exhibition, HVAC R Expo Saudi also provides industry professionals with invaluable learning opportunities through the form of free to attend CPD (continuing professional development) certified training sessions, sponsored by Samsung – Alessa Advanced Projects Ltd. The training agenda has so far hosted SASO to present on ‘Energy Efficiency of Small and Large Air Conditioners’, and is still to feature representatives from GSO and SCE to speak more on industry standardisation and development in light of Vision 2030. Free to attend and certified training sessions will also be available at the co-located FM EXPO Saudi & Saudi Clean Expo. Over 25 local and international exhibitors will showcase the latest facilities management, cleaning and waste management products and solutions at the event. 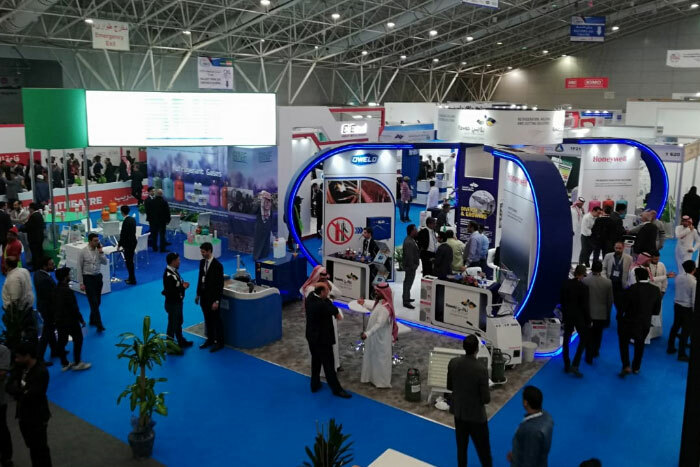 Organised by dmg events, and co-located with FM Expo Saudi and Saudi Clean Expo, HVAC R Expo Saudi runs from 28 to 30 January 2019 at Riyadh International Convention & Exhibition Center (RICEC). The event enjoys support from Carrier (Platinum Sponsor), Zamil Air Conditioners (Gold Sponsor), Al Salem Johnson Controls [YORK] (Silver Sponsor), HH-Shaker & Midea AC (Exclusive Registration Sponsor), Samsung – Alessa Advanced Projects Ltd. (HVAC R Masterclass Theatre Sponsor) and Crafft – Al Essa Industries Co. (Official Catalogue Sponsor).